Regardless of how sophisticated your building’s security system may be, if you are not controlling your physical keys, then you’re not controlling security, and your building is not truly secure. That’s the philosophy of Steve Castans, Security Director at the TOBY Award-winning NBC Tower, an office tower on the Near North Side of Chicago, located in downtown Chicago’s Magnificent Mile area. Completed in 1989, the 37-story building reaches a height of 627 feet, contains 850,000 square feet of space and three floors of underground parking with 261 spaces. Its tenants include WMAQ/NBC, WSNS/Telemundo, four foreign consulates, prominent law firms, consulting and accounting firms and retail shops. Castans employs 12 security officers at the NBC Tower for inside and outside patrols, parking lot patrols, and plaza patrols. Castans wanted a more reliable way of controlling all 200-plus building keys in order to continue to protect the individuals and residents who work in and visit the building. Specifically, he wanted to be able to maintain usage accountability and eliminate the problem of missing or overdue keys among security personnel and cleaning staff. With the help of Glavin Security Specialists in Chicago, Castans found a solution in the Morse Watchmans KeyWatcher® Touch. The KeyWatcher Touch is designed to securely store physical keys in tamper-proof cabinets, only allowing access to keys by authorized individuals with a verified code, badge, or biometric identification. Access to the key cabinet and to individual keys is under the complete control of Castans, and the automatic tracking provides full accountability for who has possession of keys at any time. Keys can be returned to any of several key cabinets on site, rather than having to return the key to the cabinet from which it was removed. Biometric identification, large, easy-to-read touch screens, voice cues, and status bar guides help to ensure a fast and easy procedure when accessing or returning keys to the cabinet. Key reservations are also used to ensure that staff have guaranteed access to a vehicle or machine when needed. 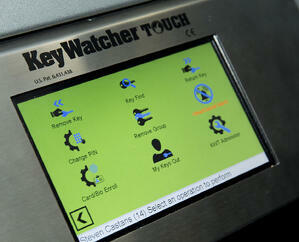 The KeyWatcher Touch system also automatically tracks the location of each key stored in a key cabinet; if a key has been removed, the system can determine who has it. Access to live information via the desktop or mobile application allows department managers to view which keys are out, if any keys are overdue, and when keys will become overdue. For immediate information regarding a key, special alert notifications using email or SMS text provide the data instantly. As the cleaning staff of the NBC Tower building speaks mostly Polish, Castans chose to utilize Polish as a second language for the KeyWatcher Touch screen. Using Polish as a second language not only allows the cleaning staff to use the box effectively and efficiently, but it also communicates to the team that they are valued and appreciated. A security camera installed near the cabinet adds an extra layer of security to the key system, helping to eliminate any doubt about who removes keys. However, Castans notes that he hasn’t needed to review any surveillance footage, as the KeyWatcher Touch system is capable of securing, tracking, and reporting key functions on its own. Castans says he’s pleased with the KeyWatcher Touch system, as he’s found a solution that makes it easier to locate and manage building keys. 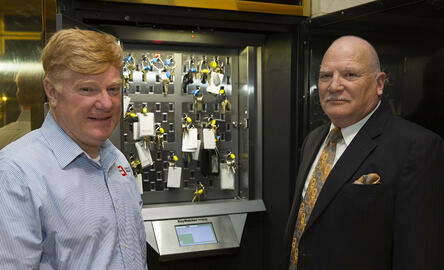 “The system is incredibly easy to use; not only user friendly, but boss friendly,” he says. Even more, individuals are held more accountable for any keys in their possession, he says, and requests for keys have been decreased as the responsibility to return them in a timely manner has increased.